Dover was miserable as I stepped off the train. A walk through town saw me narrowly avoiding being accosted by some rather dubious-looking characters. Not responding to their calls was probably the smart thing to do. 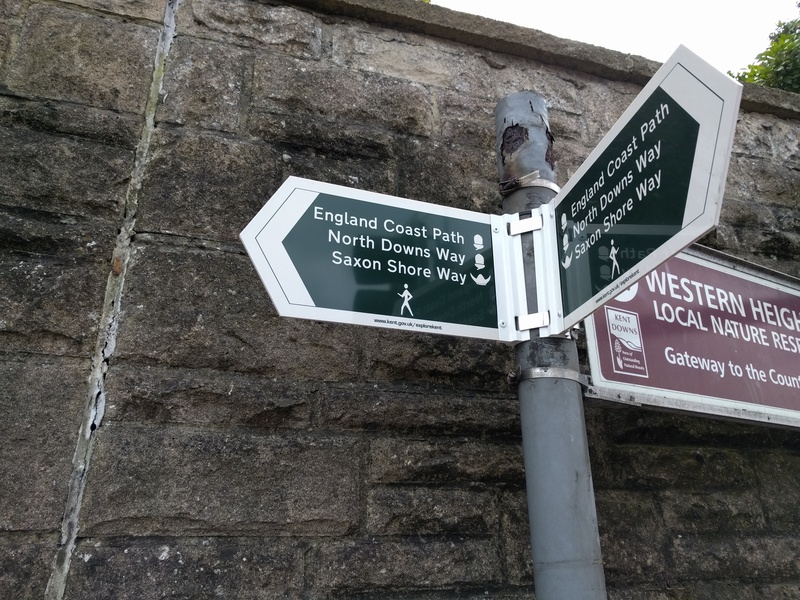 Ironically, by the time I found the Market Square and then followed the NDW I was almost back at the station, but there I found something I’ve not seen before – my first instance of a sign for the England Coast Path, a project which is due to be in place by 2020. 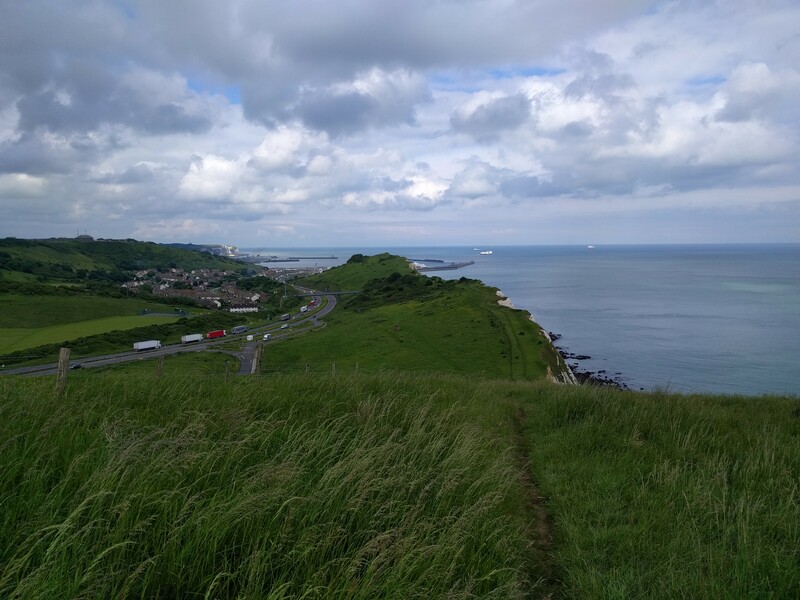 The cliffs provided a steep shock in the early part of the walk, but did afford an opportunity to look back at Dover. Ferries coming and going, lorries of several nations, and France clearly visible in the distance. A dalliance with a housing estate and the A20 and then there was nothing between me and the edge of England but grass. I made the most of it, trying to focus more on the tranquility of my left and not the hubbub on my right. 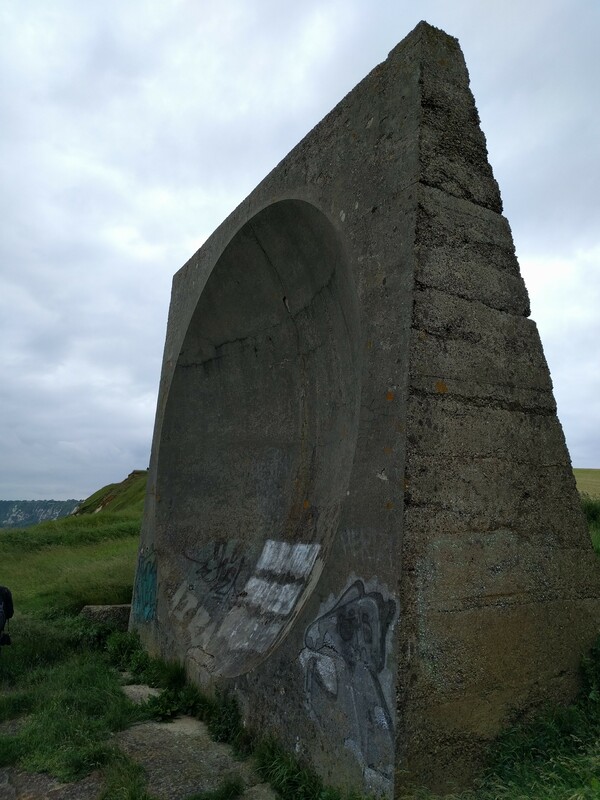 The miles passed and soon I came upon a sound mirror – an early pre-radar means of detecting approaching enemy aircraft. I remember seeing one of these on an episode of Coast, but had never seen one for real. Something else ticked off. 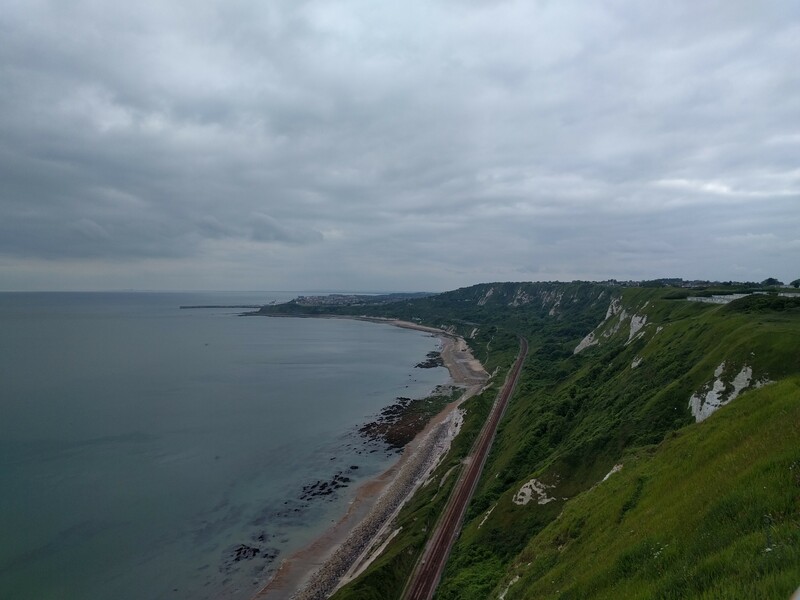 Folkestone gradually grew larger, and open clifftops started to give way to paths alongside fences and properties. 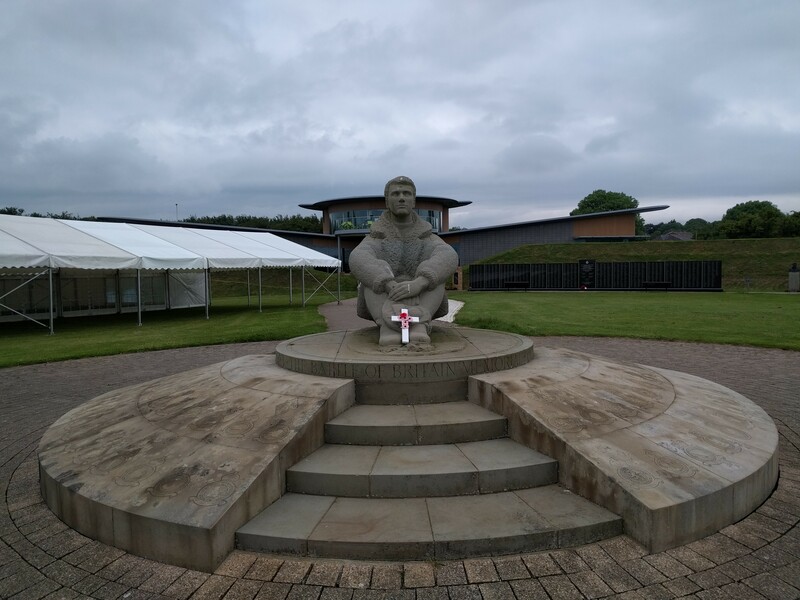 I found myself in the grounds of the Battle of Britain Memorial, clearly well after closing time, and a vague sense that I shouldn’t be there. But the footpath passes through it. It just felt a little odd. 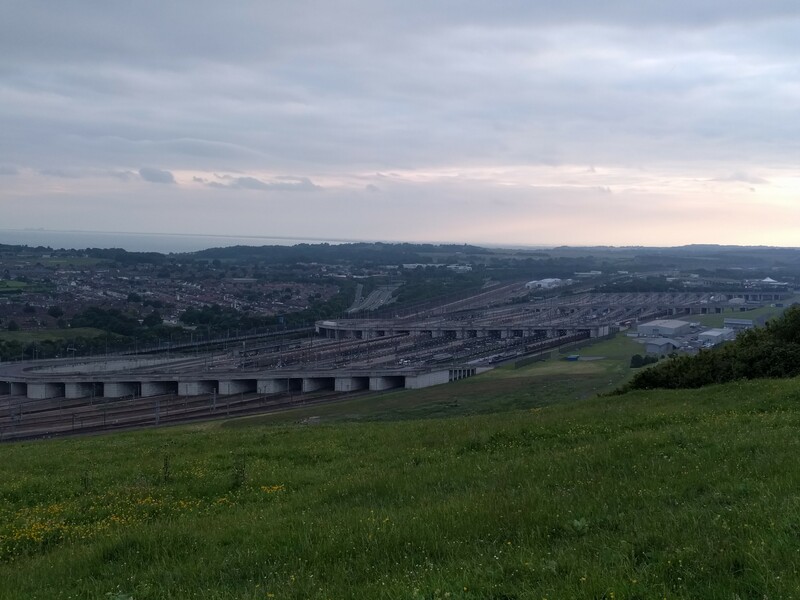 Onto the road, and the Downs themselves started giving sweeping views over Folkestone and, as I drew further inland, to the very obvious hustle and bustle of the Channel Tunnel Terminal. 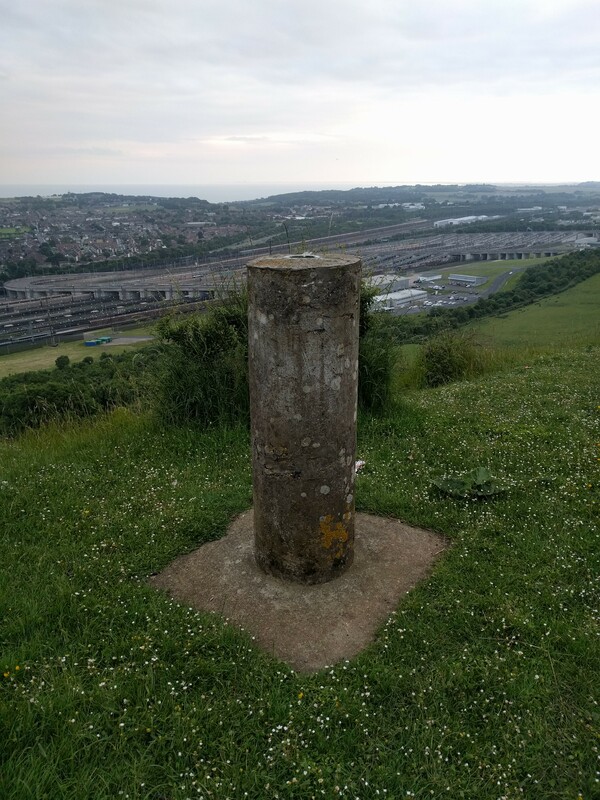 The hillside above the Chunnel Terminal also yielded another first for me – my first Vanessa trig point (well I think it’s one from its shape anyway, but couldn’t easily find definitive confirmation). Out of the nature reserve and the warning signs of £20,000 fines for camping, and into better terrain. 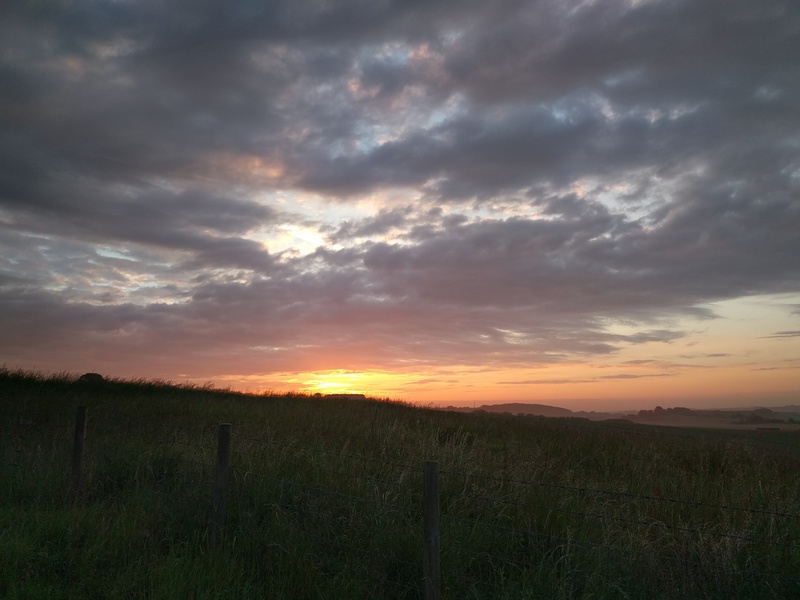 The sun was heading for the horizon as I headed on from Cheriton Hill and begun keeping an eye out for a suitable spot in earnest. A raised area around a tree looked promising and I found somewhere to tuck the Ionosphere in relatively unobtrusively. The defrosting chilli I brought for dinner was ignored in favour of something more convenient – chocolate. Then the sun was gone and the darkness crowded around. The odd clang and siren sounded from the Terminal below, my constant companion through the night. 4am came and the increasing light, and “first night in a tent” syndrome woke me early. Sunrise was watched while I packed up, the hope of an early start and early finish spurring me on. Wooded stretches of path obliterated by muddy swamps made for slow progress, not helped by general tiredness and lethargy on my part. A few spots of rain tried to work themselves up into something more. 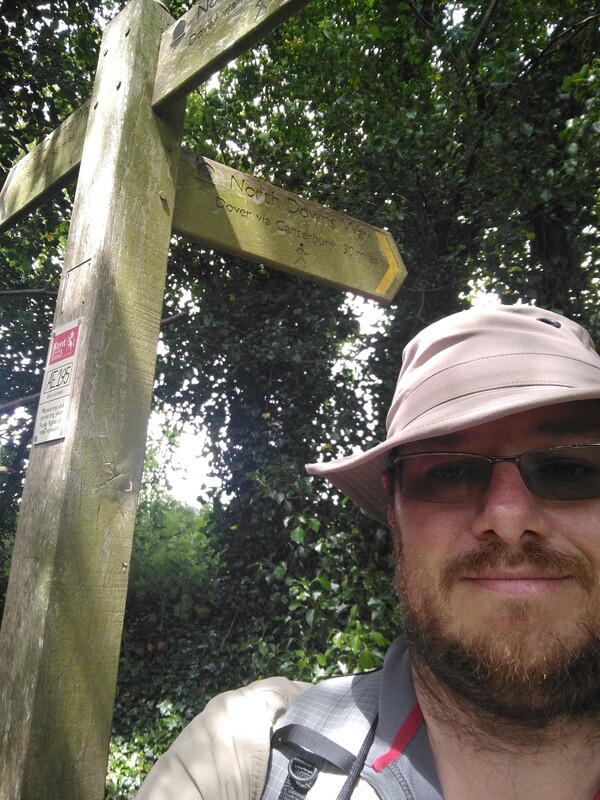 Feet hurting and progress at a snail’s pace as I emerged onto Wye Downs. Gone now was the commotion of the ports and surrounding area, replaced by the more normal tranquility of Kentish countryside. Aching feet aside, this would have been pleasant. 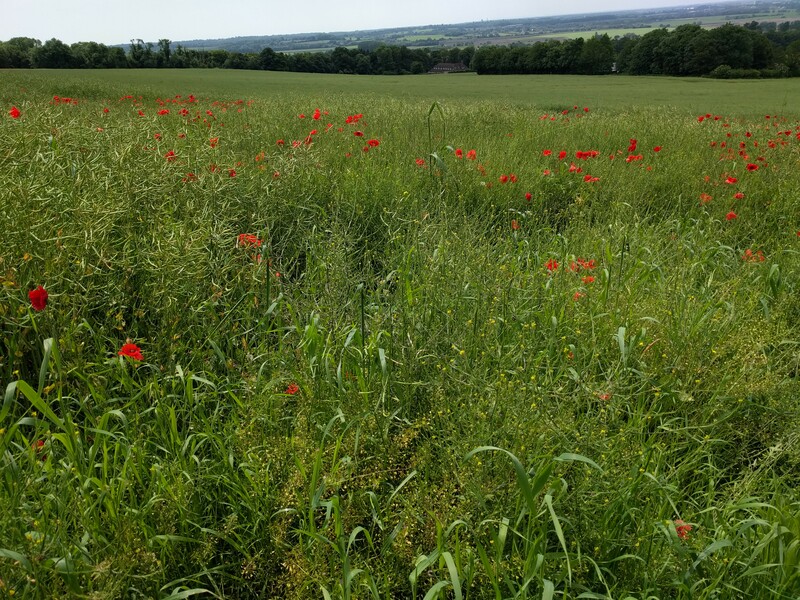 The final descent off the Downs towards Wye took me through a field of poppies, a regular feature of the North Downs. One of my most abiding memories of the walk over the years, and it seemed right that as I left the peace of the trail, there should be a final show. Through Wye and then just a few fields to navigate before the lane that would take me back to Boughton Lees and the car. All of a sudden, it was upon me, I rounded a bend in the lane and the sign proclaiming the three directions of North Downs Way was there. 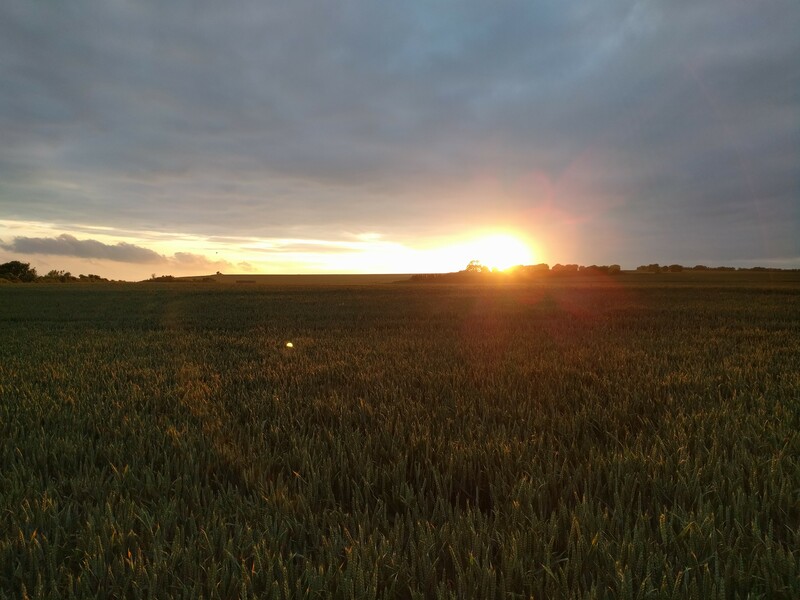 I gave it a hug, a small flicker of something passing across me at finishing another long distance path, and one that had been underway for so long. A selfie with the sign as proof and then I headed back to the car and home. It was only when I got home, and I looked up the equivalent photo of the same sign from 5 years ago, that I noticed the badge showing the path as part of the E2 European route had been removed. I’ll leave you, dear reader, to read into that what you will. The path is now done, a project begun in February 2006 as something to be completed in that year as training for the hills, but then shelved until 2011 and then again until this year. I don’t know why there have been such big gaps – in the meantime I’ve done a few complete paths. I don’t know what it is about the North Downs Way that has made it get dragged out for so long. 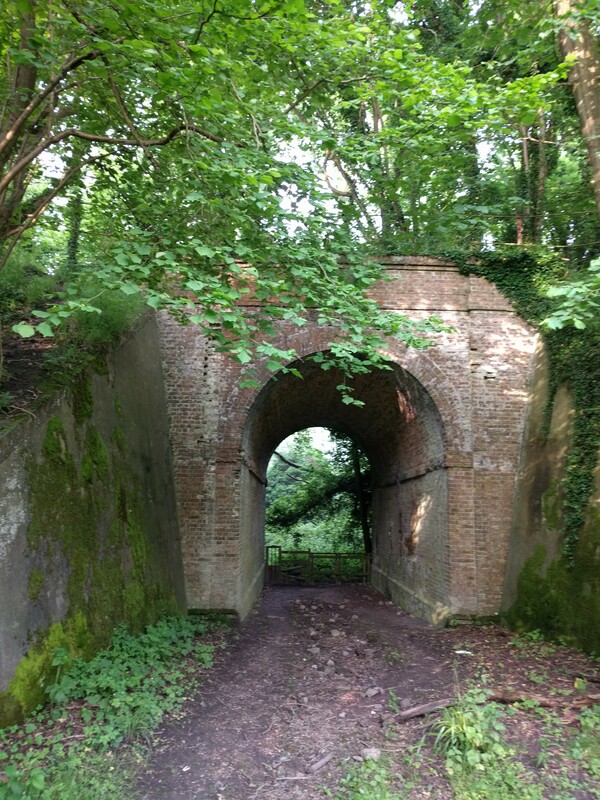 But I do know that there have been some special moments on this trail, much contemplation has been had in the sunken paths and holloways, much silent gazing down over extensive fields, a gradually increasing sense of adventure as the path has progressed further east into the Land of the Men of Kent. A feeling of being at home that I don’t get walking in Essex. This path and its tribulations are over, but maybe only for the time being…. 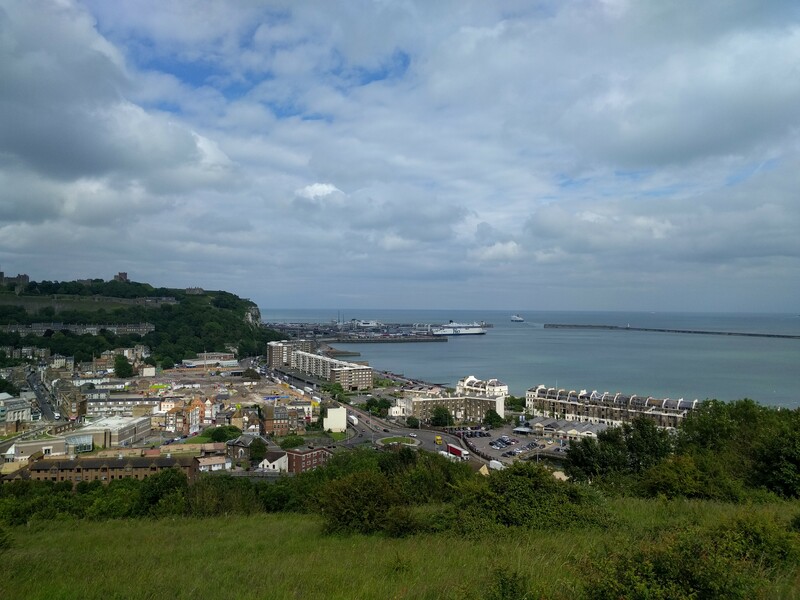 Unfortunately there’s a lot about Dover that isn’t welcoming on the eye, but equally a lot that is as well. There was a lot of dubious characters when I walked through it last year as well. Overall, NDW a great hike though – congrats! Thanks. I’m thinking of carrying on back to Farnham already. light, but could be cold and very draughty. Age thing means I like a bit of comfort now. 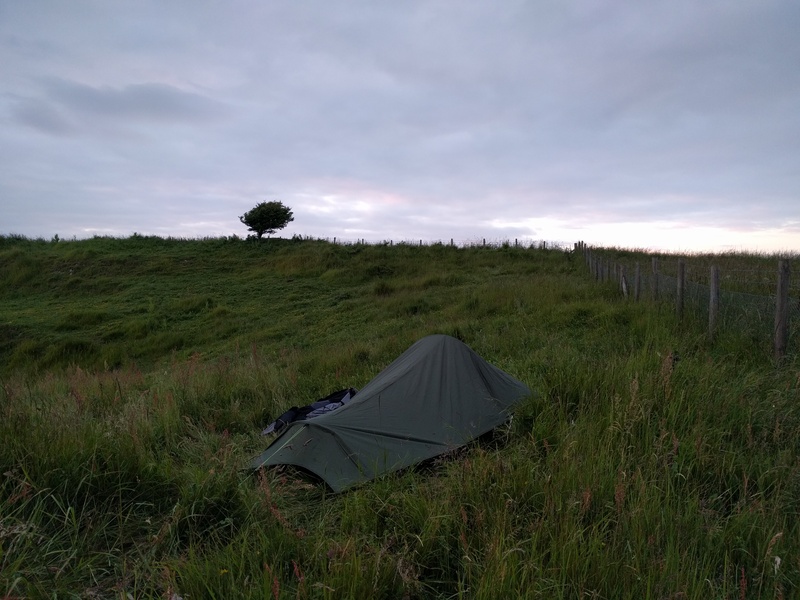 Yes I still have the Scarp but not been out in it yet this year – largely because it’s not the shelter for lowland stealth camps. I can recommend the Scarp wholeheartedly, especially with the new adjustable inner . I also have a Six Moons Lunar Solo which is a bit like the Zpacks tents in overall shape. It can be a bit draughty in cooler conditions due to the big open bit under the beak, and being single skin condensation is a bit of a challenge. More of a summer / nice weather tent in my view. The Scarp’s great in any conditions though, albeit a bit of overkill in really nice weather.